Since another hour of searching through computer manufacturer websites didn't turn up anything that stands out as interactive advertising, I popped over to Banner Blog to see what I could find there. Can't really get more content-related then this. Dell chose to highlight the gaming power of it's XPS laptop. Moving your mouse anywhere moves the weapon's targeting, and a red diamond specifies the sweet spot to hit. Once you've destroyed the tank, you can continue to "play" as a helicopter flies about begging to be destroyed as well. Fast forward maybe 5 years? Will ads like these actually contain a viable representation of a console game? Which has me thinking. 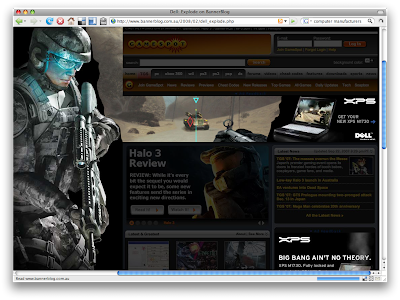 Dell features a secret Level from Halo 6 that you can play on Gamespot.com, right on the homepage. Complete this level and get 10 Xbox Live achievement points. SOLD to the achievement whore typing this. So, there isn't really much interactivity here. 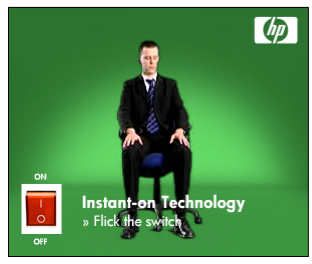 However, seeing a man moving around in his chair in the first frame (it's video) does make you wonder what will happen when you hit the switch. The pay-off however, is rather weak. This whole part of the post is weak, I'm not even sure if that's for a laptop or computer anyway. 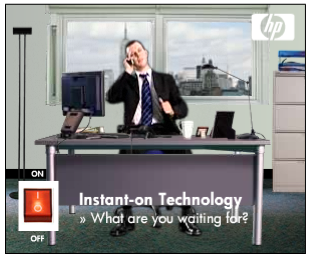 HP is pushing the personal aspect of their computers. The "build a poem or message" mechanic is making its rounds. I think it needs something more though. If you could leave a message for the next person to come to this page..that would be pretty cool.